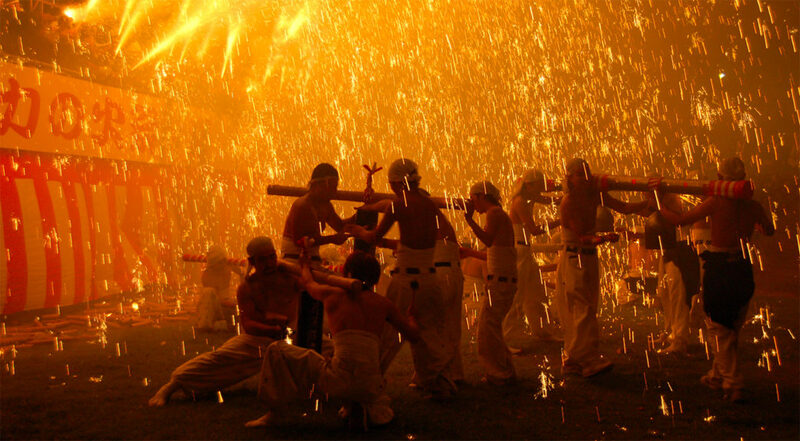 The Tejikara Fire Festival is held at Tejikara Shrine in Gifu City on the second Saturday of every April and is said to have a history of more than 300 years. Cascades of fire sparks rain down on men stripped to the waist who carry the portable shrine on their shoulders; great sprays of fire sparks also fly up from the portable shrine; a lot of men dance wildly around the portable shrine clanging bells and lighting firecrackers. This is a dynamic festival of sound and fire and highly recommended! Having lived for so many years in Gifu, I was lucky enough to see this festival on many occasions. In fact, the April festival became so popular that it's now recreated each year during the summer, on the second Sunday of August on the riverside of the Nagara river. If you're planning to visit for the main festival in April, be advised that the grounds of Tejikarao Shrine are not large and it will be absolutely jam-packed! For me, the Tejikara Fire Festival ranks as one of Japan's more incredible sights; with all the health and safety rules in the West, it's hard to imagine anything like it ever being given the green light over here and there's no doubt that the young men taking part get some pretty extensive burns as a result, although the copious amounts of sake they drink beforehand help to dull what must be quite a lot of pain! If you're there as a spectator and are standing anywhere near the front of the crowd, expect a lot of fiery sparks and embers to come your way as well!